Holy Heinz! | Do the twisted. Well, the wait was worth it. CBS reported it’s the first major change Heinz has made to their handy dandy ketchup packets in 40 years. But I beg to differ. It’s not just major, it’s COLOSSAL! Lives, burgers, french fries, and sandwiches will never be the same. 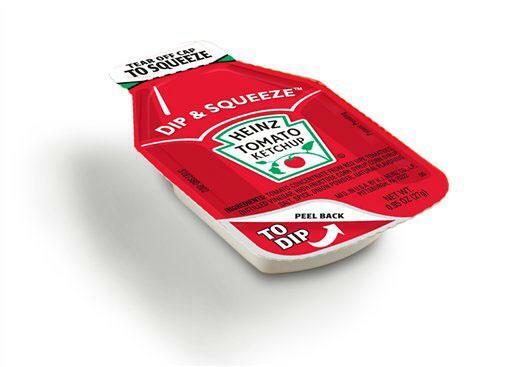 Now good for a dip or a squeeze, it’s every ketchup lover’s dream come true. And with three times as much of the good stuff in each packet, your fingers have a new kiddie pool to swim in! No need to rub your eyes with french fries. This is real. Confused as to how exactly these genius packets work? Here’s a video that demonstrates. There is no sound because no words need to be said. It’s pure, wondrous beauty. Keep a Kleenex nearby. Are you trying to bait me into that old ketchup argument again? I still stand by my opinion that Heinz is NOT the best. That there are indeed OTHER kinds. Look, you did it again Sullivan! Rip open that old ketchup wound! Go Aylmer Ketchup Go! Hahaha. When I taste it, I’ll see about believing it. Bring it Walker, Aylmers Ranger. The whole design is mind boggling to me. What took Heinz (or any condiment packager) so long? I can’t even imagine how long they have been engineering this life changing creation. If you ever thought people had issues taking too many packets, and secretly stashing them in purses and pockets for later use, you haven’t seen anything yet. Restaurants may start rationing them out as if it were WWII. New Heinz ketchup packets…soon to be found in a household bowl of random restaurant condiments near you!